Lithium's SMMS is best for brands prioritizing response to customer interactions across social. 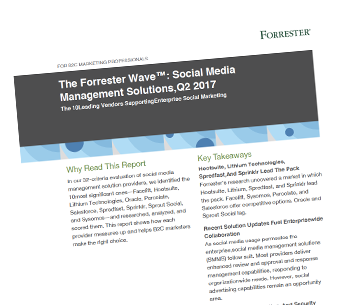 Enterprises have matured in their use of social media, according to “The Forrester Wave: Social Media Management Solutions” report. Marketers actively embrace it, as do other business units such as customer service, product, sales, and HR. So what does it take to meet the needs of today’s enterprise brands? Vendors in this report were evaluated based on a number of criteria across three main categories: Current Offering, Strategy, and Market Presence. See why Lithium was named a leader, and learn how to make the right choice on a Social Media Management solution for your brand.